Alexander Dennis (formerly known as TransBus International) is a British bus building company based in Scotland. The largest bus and coach manufacturer in the United Kingdom, Alexander Dennis is one of the world’s fastest-growing bus builders, with manufacturing plants and partnerships in Canada, China, Europe, Malaysia, New Zealand, South Africa and the United States. In early 2016, Alexander Dennis had a 44% market share in the United Kingdom. As at April 2014, Brian Souter and Ann Gloag collectively held a 55% shareholding. Alexander Dennis was formed as TransBus International on 1 January 2001, when Mayflower Corporation (owner of Dennis and Alexander) merged with Henlys Group (owner of Plaxton). TransBus International inherited a number of factories around the United Kingdom from all three merged companies: the former Alexander factories in Falkirk, Scotland and Belfast, Northern Ireland, the former Plaxton factories in Anston and Scarborough, the former Northern Counties factory in Wigan, and the Dennis factory in Guildford. TransBus International produced a range of both bus and coach chassis and bodies as well as fire engines. Included among its range of chassis were the Dennis Dart, one of the all-time best-selling buses in the UK, and the Dennis Trident. TransBus also produced export variants for service in Hong Kong, New York City and other locations. The Dennis Trident is the most common bus model in service in London. Since the creation of TransBus merged both Plaxton and Alexander, the TransBus range included Plaxton coaches as well as two double-decker bodies (the Plaxton President and the Alexander ALX400), the Alexander ALX300 citybus and the Pointer body built in quantity on the aforementioned Dennis Dart chassis, which replaced the Alexander ALX200 body built previously on a Dart chassis. On 31 March 2004, TransBus International was put into administration. On 17 May 2004, the Plaxton coach business was sold in a management buyout and resumed trading as Plaxton. TransBus had been in the process of eradicating the traditional company names from the vehicles. 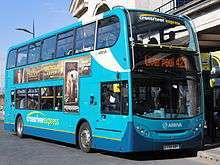 On 21 May 2004, the remaining part of TransBus (Alexander and Dennis) was bought by a consortium of merchant bank Noble Grossart and businessmen David Murray and Brian Souter. The new company was named Alexander Dennis. The sale did not include the former Alexander Belfast plant, which closed. On 26 January 2005, Alexander Dennis' Wigan plant closed, after completing outstanding orders of its President body. Alexander Dennis secured a number of major orders from UK operators. The company has also continued to find success in its predecessors' traditional markets of Hong Kong and the Republic of Ireland, with the Enviro500 securing orders in both markets, and the ALX400 double-deck body remaining the Dublin Bus standard vehicle until production ended in 2006. Alexander Dennis is also building its share of the North American market, securing £25m worth of orders in 2005 for its Enviro500 model from customers in Victoria, British Columbia, New York City (open top models), San Francisco and Las Vegas.